The M62 faces overnight closures until spring 2019 as the next phase of the congestion relief scheme gets underway. Work will begin at junction 28 for Tingley on Monday, September 24, to widen the westbound exit slip road to four lanes and the eastbound slip road to three lanes, improving access off the motorway. There will be road closures between 8pm until 6am that will be signed in advance, with work expecting to finish in the spring of 2019. Highways England project manager Esref Ulas said: “We are pleased to be moving to the next stage of this important work to improve these busy junctions on the M62. The scheme, which aims to improve journey times and ease congestion, is being funded by Highways England and will be delivered by Leeds City Council. 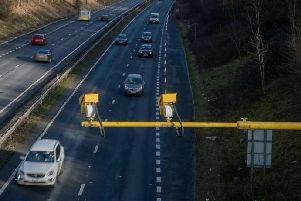 It is being funded as part of a nationwide £220m Congestion Relief Fund which was announced by the Government last year to help tackle congestion in local areas and improve connectivity. The work to improve junction 27 at Gildersome is continuing, with the westbound slip roads now fully open and work to add a third lane to both slip roads underway.